Gravitational waves are ripples in the fabric of spacetime. Predicted by Albert Einstein in his general theory of relativity in 1916, gravitational waves are emitted by accelerating masses analogous to electromagnetic waves emitted by accelerating charges . Although gravitational waves have not yet been detected, they have been indirectly shown to exist by Russell A. Hulse and Joseph H. Taylor Jr., who received 1993 Nobel Prize in physics. What makes direct detection difficult is that these waves are extremely faint due to their weak coupling with matter – even for violent astronomical events such as collisions of black holes and supernova explosions. Direct detection, therefore, requires instruments with unprecedented precision. Laser-interferometric gravitational-wave detectors, such as those of the Laser Interferometer Gravitational-Wave Observatory (LIGO) , are designed to measure displacements of the order of 10-18 m, or one-thousandth of the diameter of the proton, caused by passing gravitational waves that propagate from the distant universe. The LIGO detectors employ Michelson interferometry in which the difference in light travel time between the two arms of the interferometer is measured with high precision using controlled laser light. But the story is not that simple. The quantum nature of photons prohibits us from increasing the detector sensitivity infinitely – Heisenberg’s uncertainty principle imposes a fundamental limit on the precision with which displacements caused by gravitational waves can be measured. The so-called quantum limit is set by the zero-point fluctuations of the light in the interferometer. Laser-interferometric gravitational-wave detectors such as LIGO are so sensitive that they have already confronted the quantum limit. In next generation detectors such as Advanced LIGO, optimization of classical parameters will reach the limits of conventional technology. So, is this the end of the story? Fortunately, the answer is no. We haven’t used all the resources yet. The quantum limit can be overcome by use of non-classical or squeezed states of light  – states in which fluctuations are reduced below the symmetric quantum limit in one quadrature (like x) at the expense of increased fluctuations in the orthogonal quadrature (like p), while preserving the uncertainty principle (Δx Δp ≥ ћ/2). In the 2Physics article dated April 3, 2008, Roman Schnabel and Henning Vahlbruch reported their achievement of a world record in the strength of squeezing – more than 10 dB of squeezing for the first time. 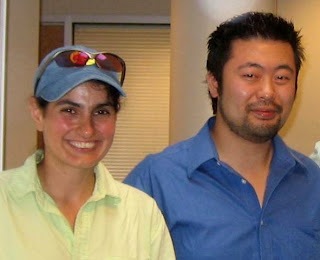 In a recent paper entitled “A quantum-enhanced prototype gravitational-wave detector” , a team of LIGO scientists demonstrated improved sensitivity in a prototype gravitational wave detector at frequencies where the detector sensitivity was limited by photon shot noise, by injecting a squeezed state of light into the output port of the detector. 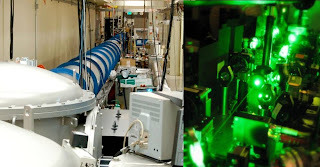 The prototype detector consists of suspended quasi-free optics with a readout and control scheme similar to those used in the currently operational LIGO interferometers. In the demonstration, the team prepared a squeezed state with about 9 dB of sub-shot noise using a below-threshold optical parametric oscillator pumped by a powerful second-harmonic field , and injected it into the interferometer. Figure 2 shows the noise floor of the prototype gravitational wave with a simulated gravitational wave signal at 50 kHz detector without (red) and with (blue) the injection of squeezed light. The sensitivity of the interferometer is limited by photon shot noise at frequencies above 42 kHz. The broadband shot noise floor was reduced by the injected squeezing while the strength of the simulated gravitational wave signal was intact, thereby improving the signal-to-noise ratio. The result of the squeezing-enhancement in the prototype detector is shown in Figure 2. The comparison between the two spectra shows that the noise floor of the interferometer was reduced by the squeezed light injection at frequencies where the detector sensitivity was limited by shot noise. 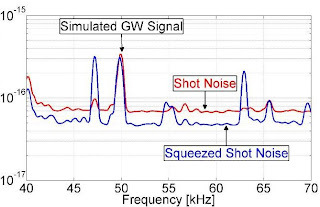 Figure 2 also shows the noise floor with a simulated gravitational wave signal at 50 kHz, with and without the injected squeezing. The broadband quantum noise floor was reduced by about 3 dB while the strength of the simulated gravitational wave signal was intact. This corresponds to a 44% increase in signal-to-noise ratio or detector sensitivity. In kilometer-scale gravitational wave detectors, this would correspond to a factor of 1.443 ≈ 3.0 increase in detection rate for uniformly distributed gravitational wave sources such as coalescing neutron star binaries. This increase by a factor of 3 is significant because the occurrence of detectable gravitational waves is extremely rare – once every few years for binary neutron star coalescences at the present LIGO sensitivity. This demonstration is an important step towards implementation of squeezing injection to improve the sensitivity of existing gravitational wave detectors worldwide. In fact, the installation of a squeezed source in a LIGO interferometer in the near future is under consideration, making gravitational wave detectors an important practical application of squeezed states of light. It is expected that within the next decade all interferometric gravitational wave detectors in the world will routinely use squeezed light. Science 256, 325 (1992), Abstract Link. “Squeezed states of light,” D. F. Walls, Nature 306, 141 (1983), Abstract Link. Nature Physics, advance online publication, doi:10.1038/nphys920 (2008), Abstract Link. Optics Letters 33, 92 (2008), Abstract Link. Nice article. I would like to know how you'll handle the issue of 'asymmetries' inherent in geometry and optical elements between two arms of LIGO-type interferometers, which may seriously limit the advantages of squeezed light. Hopefully squeezed light would be the last important improvement in LIGO before gravitational waves get detected! A Good step forward !